Last summer, Michael King and his wife Sabrina came up with a dream: to open up a tour company that guides visitors through some of the area’s best breweries and brings people together over good food and craft beers. King has been working on establishing Eastern Sierra Brewery Tours since last August and their first tour finally kicked off earlier this year in May. The tours that King’s company offers do come with a very laid-back vibe, indeed – educational and entertaining, but also mellow and fun. 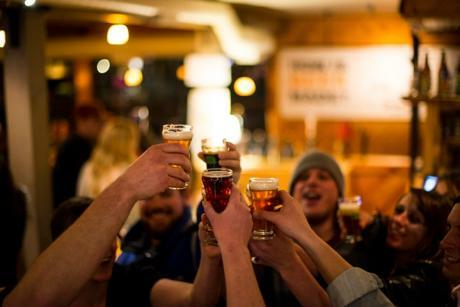 Guests get to experience three different alpine breweries during their tour: June Lake Brewing, Black Doubt Brewing, and Mammoth Brewing Company. Guests can choose from one of four pick-up locations in Mammoth and June Lake, and the company is currently working on incorporating a pickup location in Bishop as well. Beer-lovers get to drift from one brewery to the next in luxury, 12-passenger vans and will receive all kinds of background on their brew from their “beer geek” tour guide. According to King, a typical tour starts with a pick-up at Rafter’s Restaurant and Lounge in Mammoth Lakes and then straight to June Lake Brewing so his group can beat the crowds. Guests will spend an hour there and even eat lunch at the brewery, all while they are talked through the brewing system and what makes each brewery along their journey special. Tours start at about 11:30 and go for nearly four hours, with guests spending about an hour at each brewery. Currently, tours are offered once a day every day except Tuesday and Wednesday, but King is working on incorporating Friday and Saturday night tours eventually as well. King’s entrepreneurism and forward-thinking attitude shines through in his hopes for his company, and his main focus is to get the word out so visitors can enjoy the artistic handiwork of the brewers in the Sierra. Interested in booking a brewery tour? Visit http://easternsierrabrewerytours.com/ to see what Mike has to offer! You can also call 844-395-BEER (2337) for more information.